Well it's done! All the garlic is harvested and in the barn drying beautifully. This years' harvest was wonderful with many bulbs in medium to large size range. 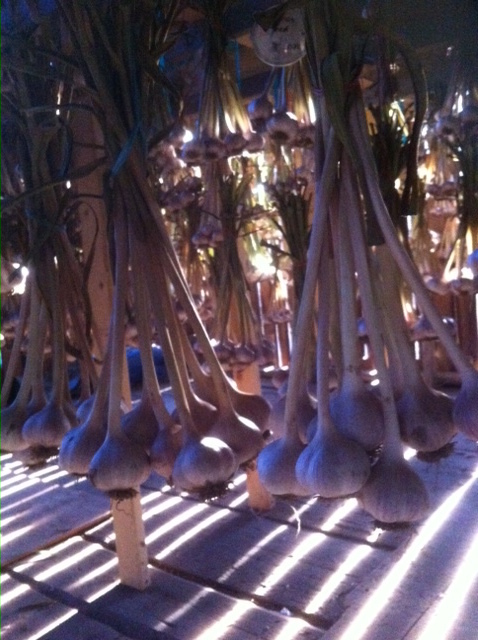 The weather has been great for drying with hardly any rain days on the harvest days, which means that the garlic goes into the barn dry. Most of the varieties listed on the web page are available for eating or planting. As in all previous years, I monitor for fusarium and virus problems. Rainy wet summers acerbate the fungal disease, and the virus issue is spread by sucking insect that inadvertently share virus from plant to plant. Aside from that, I am very happy with the crop. So now its time for upcoming garlic festivals and food shows. You can view all the shows where Railway Creek Farm garlic will be available, including the first one coming up this Saturday at the Carp Fair Grounds. http://carpgarlicfestival.ca . This is our first official show of the season and the most busiest one to prepare for right after harvest. I hope that many of you have a chance to check out any or all of these events this summer and fall.